Recently I traveled to Minnesota to conduct additional research for the Places of Invention exhibition about the early days of the region’s medical-device industry now known as “Medical Alley.” This wasn’t just any research trip, though. Thanks to a personal introduction from David Rhees of the Bakken Museum, I had the special opportunity to meet one of the region’s pioneers, Manuel (“Manny”) Villafaña. You may not know his name, but you’ve probably heard of at least one of the seven medical-device companies he has founded in Minneapolis, including Cardiac Pacemakers Inc. (CPI) and St. Jude Medical. Manny and I first chatted briefly on the phone in early June, while he was waiting for a business flight to Rome and I was in my office in DC. I had read a number of articles and transcripts of oral history interviews with him and many of his fellow Medical Alley pioneers. Still, there is nothing like meeting with inventors and innovators in person, hearing their anecdotes and getting to know them better. I always leave these conversations feeling inspired. On June 25, I hurried from the airport to Manny’s Steakhouse in downtown Minneapolis to join him for dinner. (Yes, the restaurant is named for him!) Manny greeted me warmly from his booth, where he was waiting for me patiently with customary glass of milk in hand. Over Caesar salads, a huge shared NY strip steak, and even bigger “Manny’s brownie” for dessert, we discussed highlights from his fascinating life and career. Manny Villafaña at St. Jude Medical, June 27, 2013. Born in 1940 to Puerto Rican parents, Manny grew up in a tough South Bronx, NY, neighborhood. A high-school graduate, Manny quickly showed his skills as a salesman. By his early 20s, Manny worked for Picker International selling medical products on behalf of many companies, including Minneapolis-based Medtronic Inc. In 1967 Medtronic co-founder Earl Bakken and colleague Charlie Cuddihy flew out to New York and lured him away to help expand international distribution of Medtronic implantable cardiac pacemakers. Manny told me he’ll never forget the day he and his wife arrived in Minnesota for his new job. It was March 8 and he recalls the weatherman announcing the temperature as “15 degrees below zero with a negative 43 degree wind chill.” Welcome to Minneapolis! 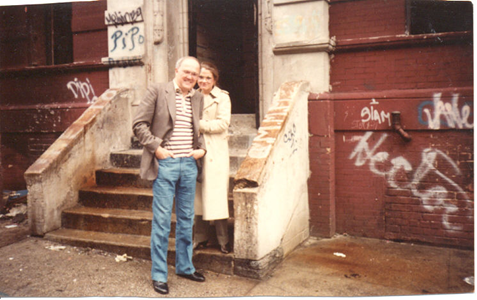 Manny and Elizabeth Villafaña at his childhood home (undated). Courtesy of Manny Villafaña. Two days after our delicious steakhouse dinner, details about Manny’s early career in Medical Alley emerged during a great driving tour he gave me. He wanted to chronologically illustrate his career and show both the growth and proximity of his various companies. So we started by driving to the small former Medtronic site where Manny first worked in 1967. At that point the company had moved from the original garage headquarters where it was founded by Bakken and Palmer Hermundslie in 1949 to a building that was about 7,500 square-feet. In 1971, Manny left Medtronic and founded CPI to develop a cardiac pacemaker he co-invented using a new lithium battery developed by engineer Wilson Greatbatch. Greatbatch, who I met in 1996, is best known for inventing the first commercially successful implantable pacemaker in 1958. Named after him and collaborating surgeon William Chardack, the Chardack-Greatbatch implantable pacemaker was licensed by Medtronic in 1960 and became the driving force behind that company’s success. About a decade later, Greatbatch’s latest battery invention became the basis for the success of Manny’s rival company CPI. As we sat in the parking lot by the 5,000 square-feet building where it was originally located, Manny told me that CPI’s first lithium battery-powered pacemaker is still running today—41 years later. 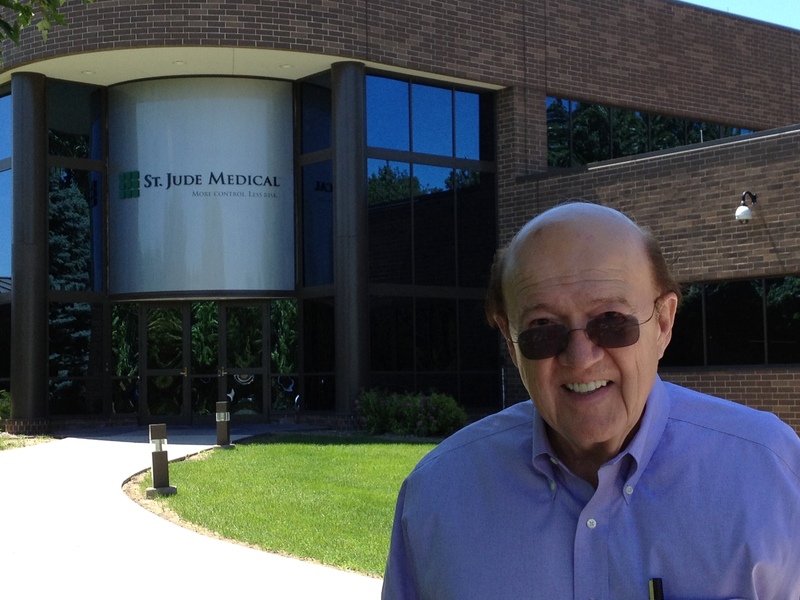 Once again as his company expanded, Manny decided to leave and start another venture, St. Jude Medical, in 1976. This time he focused on developing a mechanical heart valve, which became the industry’s gold standard. His new company moved into the old CPI office space after it moved across the highway to a bigger building. CPI (now owned by Boston Scientific) and St. Jude Medical remain Medtronic’s biggest competitors in the medical-device industry. Manny drove me to CPI’s and then St. Jude Medical’s headquarters, which are near each other today and dwarf the 5,000 square-feet industrial park buildings where they began. 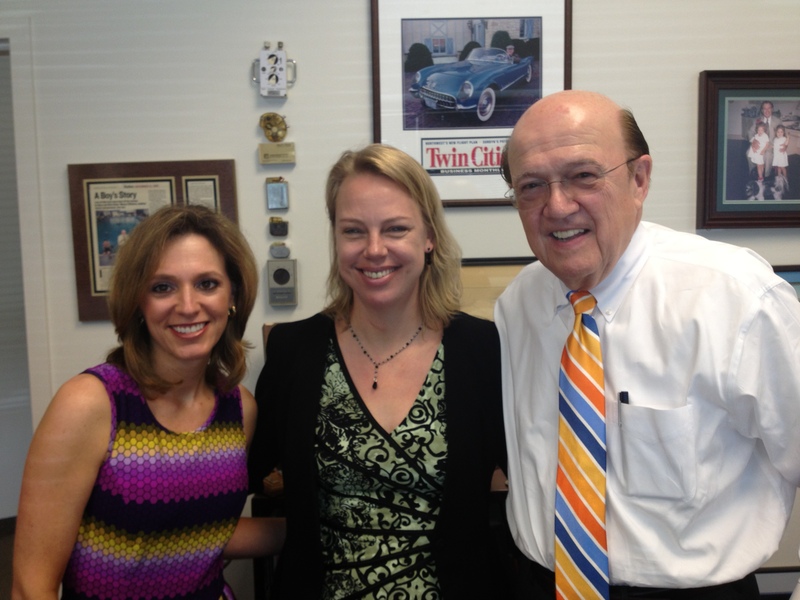 Kari Fantasia, Monica Smith, and Manny Villafaña at Kips Bay Medical, June 28, 2013. Manny gave us a brief overview of technologies he has been involved in, from the Chardack-Greatbatch pacemaker he sold for Medtronic to the St. Jude Medical heart valve he co-invented to today’s Kips Bay’s eSVS® Mesh that he believes will revolutionize coronary bypass surgery. Interestingly, his current company is named for the Kips Bay Boys Club in New York where he spent a lot of time as a kid and that he credits in part for his later success. When I asked Manny “Why Minnesota?” for all of his companies, he answered: Where else are there 10,000 engineers all in one place with such medical device expertise? It’s a highly skilled, tight-knit, hard-working community and he clearly wouldn’t consider founding his companies anywhere else. Manny is very proud of his special relationships over the decades with other key Medical Alley pioneers, including his friend and mentor Dr. C. Walton Lillehei. Medical Alley has a long history of being a collaborative, inventive community indeed. 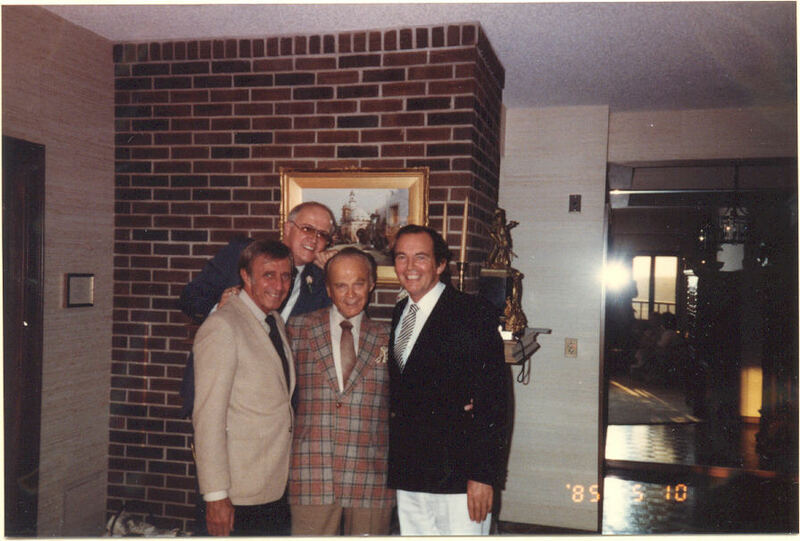 1985 photo of four cardiac pioneers who trained or worked in Medical Alley (left to right): Dr. Nazih Zudhi, Manny Villafaña, Dr. C. Walton Lillehei, and Dr. Christiaan Barnard. Courtesy of Manny Villafaña.